I invite all comers to take part in the artistic action "I'm from the Earth"
I invite everyone who wishes to participate in the art project "I'm from Earth"
Earth is our common home for all cultures and all people. 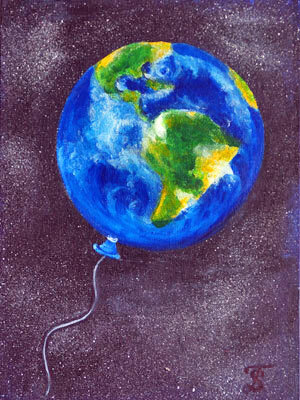 I invite you to take part in the art project "I am from Earth"
1. 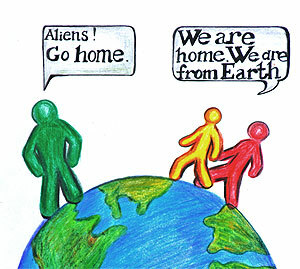 Write "I am from Earth" on a sheet of paper in your original language. 2. Take a picture with this words as shown on the sample. 3. Shoot a short video where you say “I am from Earth” in your own language. 4. 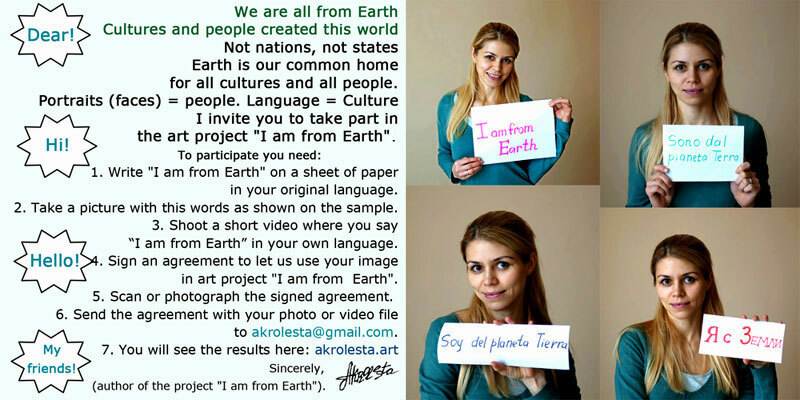 Sign an agreement to let us use your image in art project "I am from Earth". 5. Scan or photograph the signed agreement. 6. Send the agreement with your photo or video file to akrolesta@gmail.com. (author of the project "I am from Earth"). Earth is our common home. The goal of my project is to show different people, nationalities, tribes inhabit our planet. "I am from Earth. You are from Earth. We are not strangers to each other." I invite to cooperation all public and state organizations, museums and exhibition complexes.